Happy Chinese New Year 2019. Tomorrow is Chinese New Year. This will be the year of the pig. Pigs were pretty important in the olden days where pigs serve as a source of income and food for the Chinese communities. The Chinese word, Jia, for home is 家 is actually a pictorial of a pig in a home. 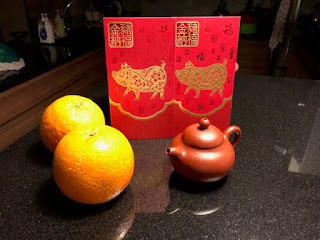 The year of the pig symbolises great abundance and happiness. If you are born in the year of the pig, you are a happy and possibly rich person. Looking back, there had been recently many economic uncertainties - Brexit and US/Sino trade disputes are some the highlights or main causes of these uncertainties in the world today. However, this bodes well for us, the Chinese tea drinkers. I do not see any significant price increases in the Chinese tea market. There is a also a possibility of 'big time' collectors selling their tea to generate cash in these wild economic times. I will be making my Guangzhou trip after April this year and I should get a clearer picture of the tea prices In China when I am there. Have a Happy Chinese New Year. I wish all my readers happiness and good health.